The Epson 1400 printer seems to be incredibly similar to the R2400 and R1800 in terms of case and waste ink design with one important difference. Instead of utilising two waste tubes this printer has only one. 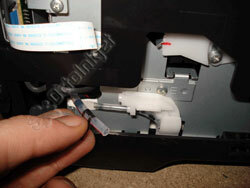 This guide provides greater detail on how to get the tube to the outside with minimal modification to the printer case. This guide also covers the 1410 and 1390 models which are essentially the same printer for different trade zones.